1960 - 1980 Indemnity insurance dominates, except for Kaiser, which covers about 5% of the population in 1960 and 14% by 1980. 1973-1980 HMOs spring up, many originating with county medical societies, others as arms of more traditional insurers. 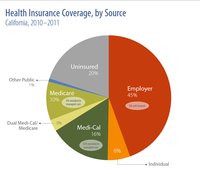 1983-1990 PPOs go from covering zero in 1980 to a third of California’s population by 1987. 1985-2005 Consolidation of health insurance plans from over twenty companies to six.